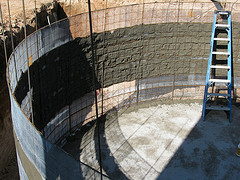 Richard Green constructed an underground 20,000-gallon concrete tank for a rainwater harvesting system for his business. Photo by Richard Green. As the need for water conservation becomes more apparent, residents across Texas are incorporating rainwater harvesting into their everyday lives. This innovative conservation technique involves capturing, diverting, and storing rainwater for later use. Reducing water costs and lessening the demand on water resources are the two main reasons people become interested in rainwater harvesting, said Billy Kniffen, Texas AgriLife Extension Service water resource specialist. "Most people who get involved just want to make a difference and be a part of the green effort to use less energy and water," he said. Kniffen, who has statewide responsibility for rainwater harvesting education for AgriLife Extension, said interest in rainwater harvesting mostly begins by word of mouth. "Master Gardeners are influential in spreading information about local programs," Kniffen said. Master Gardeners receive 16 hours of rainwater harvesting training and are armed with educational materials to contribute a minimum of 50 hours of volunteer service to earn the title of Master Gardener-Rainwater Harvesting Specialist. The training allows them to volunteer through local AgriLife Extension offices to provide horticultural related information to communities. In 2004, AgriLife Extension and the Texas Water Resources Institute (TWRI) established the Rainwater Harvesting Task Force, a multidisciplinary group of 18 or more members whose goal is to teach and train others about capturing and managing rainfall, according to B.L. Harris, TWRI acting director. Since its inception, the rainwater harvesting education group has developed several courses geared towards rainwater stewardship, published peer-reviewed Extension publications including a new rainwater harvesting manual, developed video clips teaching rainfall capture techniques, and created a rainwater harvesting website. The team has also installed rainwater harvesting demonstrations at 37 different locations across the state, including more than 20 locations in West Texas and the Rio Grande Valley. For its efforts, the team was awarded the 2008 Superior Service Award from AgriLife Extension. Kniffen said the cost of implementing a rainwater harvesting system varies depending on the system. "A simple rain barrel can be built for $20-$35," he said, "or bought for $100. Many who get involved have 1,000 gallons of storage, which costs less than a $1,000." The cost also depends on the type of tank installed and who the installer is. Having a company install the system costs about twice as much, he said. Kniffen, who lives exclusively on rainwater in dry West Texas, said his system cost $10,000. He and his wife decided to capture rainwater while building their house because they had no access to city water and the groundwater was of questionable quality. Kniffen collects water off his house and barn roof, which is about 5,900 square feet of catchment area. Like Kniffen, when John Kight began building his house in Boerne, he decided to use rainwater as the sole source of his water supply because the groundwater in his area was too hard and contained iron and sulfur. "Installing a well would have cost $26,000, and I spent $14,500 on the rainwater system," Kight said. His rainwater harvesting system includes a 7,826-square-foot roof area, and seven 5,000 gallon, three 1,550-gallon, and one 1,000-gallon aboveground polypropylene tanks for water storage. "With this system I can collect close to 4,800 gallons of rainwater per inch of rain," he said. Kight said he sees many benefits in rainwater harvesting. "It's as close to pure water as you can get," he said, "and I don't have to deal with lime build-up or water bills." Kight has always been conservation-minded and gives numerous presentations and workshops to the community to encourage rainwater harvesting. He was awarded the 2008 Texas Rain Catcher Award from the Texas Water Development Board, which recognizes excellence in the application of rainwater harvesting systems in Texas. Although most rainwater harvesting systems are for private use, about 25 percent are for commercial use, Kniffen said. Richard Green's commercial rainwater harvesting system involves running the water through an ozone treatment recirculation system and a UV light, making the water readily available. Photo by Richard Green. 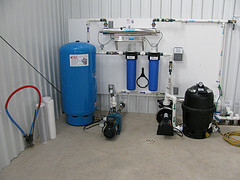 Richard Green, owner of Magline Inc. in Plainview, began his commercial rainwater harvesting project after his company's building burned down. Magline Inc. is a small manufacturing resource lab that develops foliar fertilizers or liquid solutions that are sprayed directly onto leaves. When it came time to rebuild, Green decided to collect rainwater instead of drilling a well. "The water that is needed to make the fertilizers has to be soft and clean," he said. "The quality of water that rainwater provides is better for our products." "It would have been cheaper to put in a well, but the water table in this area is declining," he said. 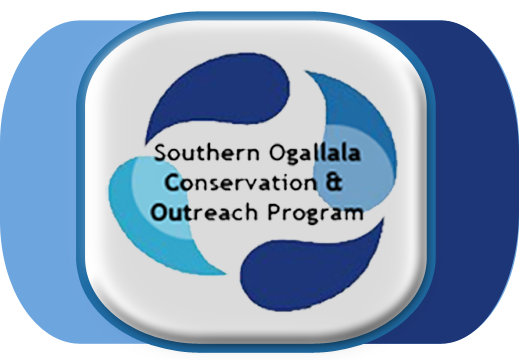 Plainview is over the Ogallala Aquifer, which is depleting at rates of 1 to 3 feet per year. His system is an underground 20,000 gallon concrete tank that runs rainwater through an ozone treatment recirculation system to disinfect the water and then through an ultraviolet light, making the water readily available and up to drinking water standards. Green said it has always been a dream project for him, and he is anxious to get rainfall in the recently completed system. Local governments are incorporating rainwater harvesting into their policies. Some cities and counties provide financial incentives for rainwater capture systems to encourage residents to conserve water. The City of Austin Water Conservation Department promotes both residential and commercial rainwater harvesting by offering rebates from $30 to $5,000, depending on the system. Rainwater harvesting projects in San Antonio are eligible for up to a 50 percent rebate of the installed cost of the system under the San Antonio Water System's Large-Scale Retrofit Rebate Program. Universities across Texas are also catching on to the idea of rainwater harvesting. As new buildings are constructed on the Texas A&M University campus, rainwater harvesting systems are being implemented in accordance with Leadership in Energy and Environmental Design (LEED), which is a national rating scale developed by the U.S. Green Building Council to encourage sustainable buildings. Texas A&M recently completed the George P. Mitchell '40 Physics Building and the George P. and Cynthia Woods Mitchell Institute for Fundamental Physics and Astronomy building. These buildings include a cistern that collects and stores both air conditioning condensate and rainfall that is used to irrigate exterior landscapes and the university's first rooftop garden. The four-building Agriculture Headquarters Complex currently being constructed will capture roof rainwater into four 9,000-gallon cisterns that are part of the canopy structure. Water will flow into a 40,000-gallon underground tank that will be used for irrigation. Two cisterns were installed at Texas Tech University on the east/west sides of the new Raider Park parking facility across from Jones AT&T Stadium. Each cistern can hold up to 14,700 gallons of rainwater that is used to supply the landscape irrigation system at Raider Park. Rainwater harvesting is a promising alternative for supplying water in the face of increasing water efficiency needs. "Incorporating rainwater harvesting into everyday lives," Kiffen said, "can potentially ensure sufficient water quantity for years to come." I live in Ohio, and there aren't any water shortage issues, per se, but I still decided to start using rain barrels a few years ago. I've purchased a few, and bought a few, and now it's a passion for me. It really hit me once I started seeing how much lower my water bills were during the summer. Ever since I put a few barrels in I water my lawn and garden all I want, without worrying about the bills to come. The bigger initiatives you talked about here are great examples of how much good can come from tapping into the rainwater surplus, instead of relying on continually dwindling city water supplies. It just amazes me that the mainstream media doesn't mention rain harvesting more, since they like to talk about other eco-related topics so much. Hopefully that will change as blog posts like this one continue to get published online. That is some nice information about rainwater harvesting, and it will surely help for raising the level of ever shrinking rainwater. Nice to see some good measures are being taken for tacking water shortage problem. And rainwater harvesting can be called best solution for that. The rainwater harvesting is one of the best way to fight against problem of water shortage. And I am planning for it in future.